If you are just looking for a spare key to open your car doors or your trunk then you can go to any place that cuts keys. 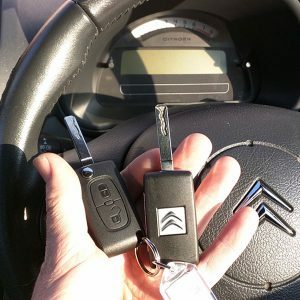 While these key copies won’t start your car, they can still come in handy if you tend to lock your keys in the car, or simply want to make sure you can always gain access to the interior of your car. Simple cut car keys are inexpensive and they can save some wear and tear on your regular key that use in the ignition especially if you don’t have an automatic trunk or door opener button in your car or if one of these buttons are malfunctioning. If you purchase a new car you may get two sets of car keys when you purchase your car. However, in cases where you purchase a used car from an individual you may only get a single set keys because the second set is no where to found. Having a spare key that actually starts your car may be important if you and someone else shares use of the car and you don’t want to have to pass the car back or forth or if you simply want a back up key in case the one you have stops working or breaks. Getting a car key that actually turns on the ignition is far different than getting one to open your doors as today’s cars (since the 1990s) come with little computer chips called transponders that are programmed to tell your your ignition to function. To get a copy of one of these keys you either need to go your car’s dealership or to a professional locksmith that has the equipment and knowledge to make a car key with a transponder and program it to work with your car. At Fresh Meadows Best Locksmith we have both the equipment and the knowledge to make that car key copy for you and program it. We charge reasonable rates and usually can make your new key in a very short amount of time. So if you are looking to get a car key copy why not give us a call at 718-233-1144 and we will be more than happy to make that car key copy for you.